The Highways Agency is reminding drivers to only stop on the hard shoulder of the motorway in the case of an emergency, after a driver pulled over because he thought his car was alight – only to find the car radio was displaying the title of the Adele song 'Set fire to the rain'. Stopping on the dedicated refuge lane on motorways in anything other than an emergency is currently illegal, but Highways Agency figures reveal that over 200 motorists in the south-east of England alone used that hard shoulder as a convenient parking spot on their journeys, between July and September last year. Jamie Hassall, Highways Agency national enforcement co-ordinator, said: "Every day, millions of people use our motorways. Most of them use the hard shoulder correctly and don't ignore red X's, but we are appealing to the few who put themselves, other road users, and those working on motorways at risk. "Where the hard shoulder is used as an additional traffic lane at peak times, you can only drive on it if there is a speed limit over it. When a red X is displayed over any lane, it's simple – don't drive on it." • One motorist pulled over because they saw "fire" on their dashboard display, it later turned out it was part of the name of the Adele track they were listening to. • One motorist parked up and fell asleep on the M6. • People stopping to read a map or check their sat-navs. • Traffic officers stopped with two cars on the hard shoulder – the owners were half way through the selling and buying process for one of the cars. • One driver realised their car insurance policy was up for renewal – they were ringing around for quotes to renew. • A group of motorcyclists parked on the hard shoulder on the M1 to review their route and have a drink. • Taxi drivers waiting on the hard shoulder around Heathrow airport for their clients' flights to arrive. • A mobile phone operator, stopping at regular intervals in their private car carrying out signal tests on the hard shoulder. • A driver who stopped to pick flowers. • Have you broken down Sir? No, came the reply, we are taking pictures of our new-born grandchild (in their open top sports car) as it is a lovely day. Have you ever stopped on the hard shoulder in anything other than an emergency? 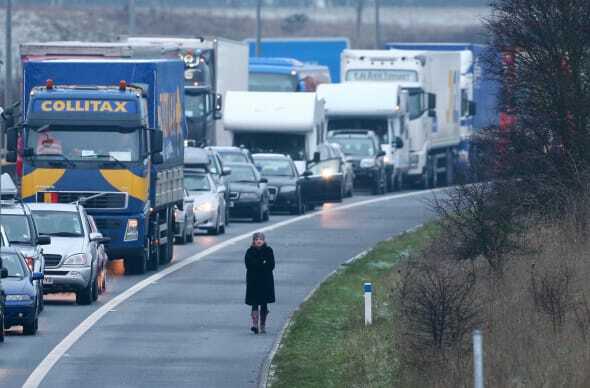 Do you think the rules concerning hard shoulder use are too strict? Have your say in the comments section below.